BACKGROUND: Transversus abdominis plane block may improve analgesia after colorectal surgery; however, techniques remain unstandardized and results are conflicting. OBJECTIVE: The purpose of this study was to compare laparoscopic and ultrasound-guided transversus abdominis plane block with no block in minimally invasive colorectal surgery. DESIGN: This was a randomized controlled trial. SETTINGS: The study was conducted at an urban teaching hospital. PATIENTS: Patients undergoing laparoscopic colorectal surgery were included. INTERVENTIONS: The intervention included 2:2:1 randomization to laparoscopic, ultrasound-guided, or no transversus abdominis plane block. MAIN OUTCOME MEASURES: Morphine use in the first 24 hours after surgery was measured. RESULTS: The study cohort included 107 patients randomly assigned to laparoscopic (n = 41), ultrasound-guided (n = 45), or no transversus abdominis plane block (n = 21). Mean age was 50.4 years (SD ± 18 y), and 50 patients (47%) were men. Laparoscopic transversus abdominis plane block was superior to ultrasound-guided (p = 0.007) and no transversus abdominis plane block (p = 0.007), with median (interquartile range) total morphine used in the first 24 hours postoperatively of 17.6 mg (6.6–33.9 mg), 34.0 mg (16.4–44.4 mg), and 31.6 mg (18.4–44.4 mg). At 48 hours, laparoscopic transversus abdominis plane block remained superior to ultrasound-guided (p = 0.03) and no transversus abdominis plane block (p = 0.007) with median (interquartile range) total morphine used at 48 hours postoperatively of 26.8 mg (15.5–45.8 mg), 44.0 mg (27.6–70.0 mg), and 60.8 mg (34.8–78.8 mg). Mean hospital stay was 5.1 ± 3.1 days without any intergroup differences. Overall complications were similar between groups. LIMITATIONS: Treatment teams were not blinded and there was operator dependence of techniques and variable timing of the blocks. 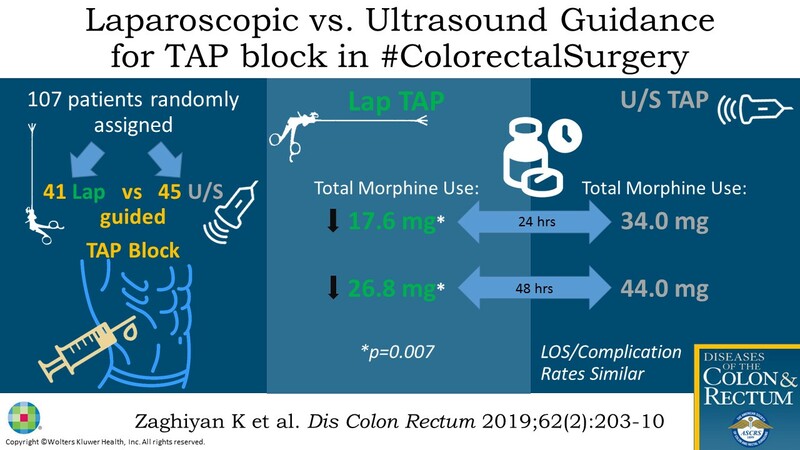 CONCLUSIONS: Laparoscopic transversus abdominis plane block is superior to ultrasound-guided and no transversus abdominis plane block in achieving pain control and minimizing opioid use in the first 24 hours after colorectal surgery. A large, multicenter, randomized trial is needed to confirm our findings. See Video Abstract at http://links.lww.com/DCR/A822. Funding/Support: Statistical analysis by James Mirocha partially funded by a Clinical and Translational Science Institute grant: National Center for Advancing Translational Sciences grant UL1TR001881-01. Diseases of the Colon & Rectum62(2):203-210, February 2019. Articles in PubMed by Karen N. Zaghiyan, M.D. Articles in Google Scholar by Karen N. Zaghiyan, M.D. Other articles in this journal by Karen N. Zaghiyan, M.D.